The original The Thing (John Carpenter’s version) is one of my favorite horror films. The implications of what happened before the events of the film, while limited in screen time, are huge in terms of the mood of the film and the story, so I’m stoked to see what happened via this prequel. I’m excited to see some more disturbing human/dog/alien hybrid monsters and a lot of gore. My only criticism is that the film sort of looks like a remake in prequel’s clothing. Mary Elizabeth Winstead, who was great in Scott Pilgrim vs. the World, and Joel Edgerton should make for an interesting cast. I honestly haven’t seen a lot of Edgerton but he’s got Warrior coming up. As for Winstead - a girl in a Thing movie??? The closest we got to a woman in Carpenter’s version was the voice of MacReady’s computer game, and he drowned the old girl with his scotch! This one holds a special place in my heart, as I’ve been really trying to find a way to see it. Magnet films just acquired it and slapped some release dates on it so it looks like my wish has been granted. 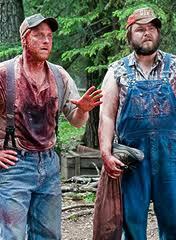 I’ll get to see lovable hillbillies Tucker and Dale fight some evil when they’re mistaken for redneck killers! Very intrigued here. Guillermo del Toro produces a remake of a made-for-TV movie about demonic little creatures that terrify the family that moves in to their big, spooky mansion. The trailers have been sufficiently creepy and gothic. Guy Pearce is always a treat. This is the big one, folks! I dug out my ticket for the first Potter film, which I saw in theaters some 10 years ago with my sisters. Has it been that long? Nothing more to say, other than the film looks good, and director David Yates has really taken over the franchise and has yet to disappoint. This is kind of the last big, fun, action movie of the year in my opinion. Also of note – it’s the last of the Marvel films before the big one hits – The Avengers. It will be interesting to see how Joe Johnston can do after the sufficient but underwhelming The Wolfman. 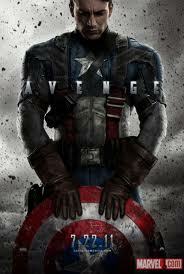 And this is the second Marvel character Chris Evans has portrayed. P.S. I think this is like, the 5th comic book character he’s played total. If I had a choice between this film and Melancholia, another drama/planetary sci-fi mashup, I’d take this film any day. The beginning of the trailer, with footage of one of Earth’s scientists making contact with her “Earth 2” counterpart interlaced with beautiful imagery of “Earth 2” hovering in the sky over our own planet, is chilling and wonderful. “Has the other me made the same mistakes I’ve made?” someone asks. “And is that me better than this me?” “Whoa!” says my soul. 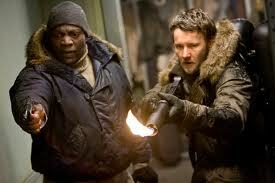 I’m curious to see what director Ruben Fleischer can do post Zombieland. I think both Jesse Eisenberg and Aziz Ansari are solid comedy actors, and Danny McBride is obviously always awesome. And Nick Swardson has been saved from Adam Sandler movie hell! Here we go. This is how I like my Paul Rudd. He was really just annoying in I Love You, Man and How Do You Know (although I didn’t see the latter because of the vibe Rudd was giving off in the trailers – among other things). He’s best when he’s playing goofy, like here and Anchorman or dickish, like in The 40 Year Old Virgin or Role Models. The rest of the cast looks great as well. Very excited. Paranormal Activity was creepy and Paranormal Activity 2, while not as creepy, kept me guessing as to the plot until a few months before the film dropped. I’d much rather see a PA movie every year than a Saw film. I’m excited for this one, even though the plot, according to this article I read at JoBlo is really stupid (a prequel when the sisters were kids??? Is it on VHS?). I think that plot smells a little fishy (and no, it’s not because the filmmakers this time around are the people behind Catfish (ugh). My prediction on the actual plot – daughter from the second teams up with docs from the first to find Katie and Hunter. Love the original. Love the character of Lisbeth Salander. Love Daniel Craig. Love Fincher. Rooney Mara scares me. I’m in! Another Earth looks like it could be fantastic, and I'll be seeing the new Girl with the Dragon Tattoo, if I to compare Rooney Mara to Noomi Rapace! You have to check out the first PA - very creepy. Aces list of upcoming films man. I'm not so much a fan of the Paranormal Activity films myself, but it's always nice to be reminded of the cinematic goodness that is out there and on its way.